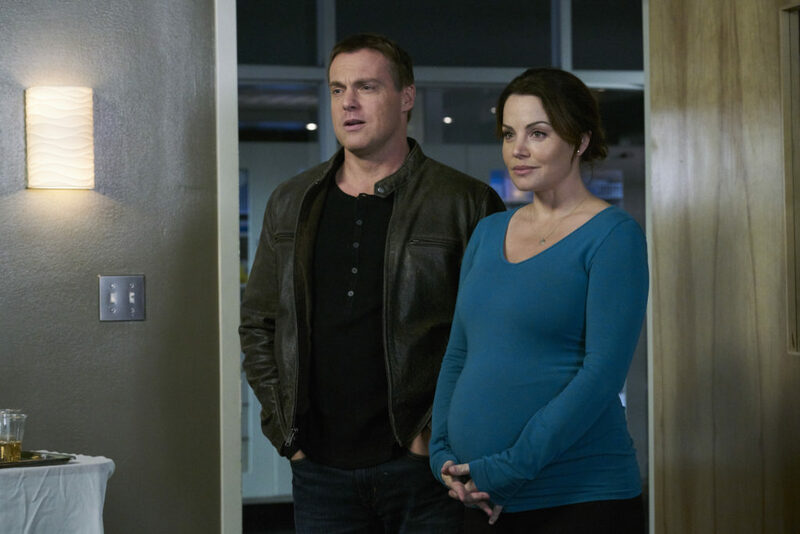 It is the penultimate episode of Saving Hope and sometimes after 5 seasons and some odd episodes you forget about certain people that make the show. That one person is Joseph Pierre as nurse Jackson Wade, often a comic relief character, who got a emotional episode just as the series is about to come to a close. In some Hope Zion tidbits, Dawn has asked Jeremy to stay on as a general surgeon with the exit of Cassie and Charlie leaving. Dawn also tells Jeremy that she believes Charlie will return to work once his daughter is born. Elsewhere, Billy asks for his OR schedule to be reduced. Dawn thinks it is because Billy is traumatized after last week’s incident with Cassie’s stalker but he says that isn’t the case. Shahir and Dana are avoiding some conflict in their lives. Shahir thinks it is best to break up Jonathan as the adoption process is wearing on their relationship but is avoiding having that conversation. Meanwhile, even though Dana finds trauma exhilarating, she finds it exhausting at the same time and is avoiding telling Dawn that. Also, Dana isn’t so sure that she wants to host a medical show about uplifting plastic surgeries. Huse Madhavji as Shahir Hamza, Matt Gordon as Liam Quinn and Wendy Crewson as Dana Kinney and Greg Calderone as Billy Scott. Luckily the two are distracted by their patient Liam, who has woken up after a three week coma but to discover that he thinks it is 1997 and he is 19. Dana wants to tell him it is 2017 and that he is 40 but Shahir doesn’t want to overwhelm him with too much information. Also, Shahir thinks it is bad idea to tell him that his parents are dead and that he is married. Dana disagrees and thinks they should tell Liam the truth to get him ready to cope with things. Unfortunately, his wife Elise arrives and spills the beans about the nature of their relationship and that his parents are dead. Liam is understandably upset and kicks everyone out. Back at Shahir’s office, we learn that a little girl in Edmonton is looking for a family and he and Jonathan are the perfect candidate. Shahir doesn’t know if his heart is in it. Dana asks it is the notion of being a father or the adoption process that has worn him down. Dana then looks through Liam’s things and comes up with an idea. Elise arrives with a picnic basket filled with Liam’s favourite things. Liam again tells Elise that while she is nice, he doesn’t remember their adventures together. Elise asks for a chance to get to know each other again and relieve their first date. We see the two get to know each other again over Chinese food. This seems to inspire Shahir and Dana to go back to the beginning too and what made them pursue adoption and being a doctor respectively. We see Dana turn down the TV gig but still is going on that date with that silver fox TV producer a few episodes ago. We also see Dana go to Dawn and request that Hope Zion open up a burn unit where she will teach the young doctors. We also learn from Shahir that Jonathan has bought two tickets to Edmonton that night to see their potential little girl. However, everything gets put on hold as a major casualty from a highway accident comes in that involves multiple ambulances. All is quiet in the ER, notes Dev but Jackson and Zach thinks he just cursed them. The next patient that walks in is Randy Rogen who is looking pretty jaundice and has a bad cough. Randy blames the jaundice on living in a windowless and mouldy basement suite that he is about the evicted from. Randy uses Jackson’s phone to try and reschedule a job interview but unfortunate cannot. Randy tries to leave but collapses. We learn that Randy has end stage liver disease but cannot go on a transplant list because he is soon to be homeless. Zach and Jackson spring into action to help Randy. Just before Randy goes into surgery to fix an esophageal bleed, he gives Jackson his wallet. Inside, Jackson finds a picture of Randy’s son. When Jackson calls Randy’s son to let him know about his dad’s condition, we learn that they don’t have the best relationship. Randy confesses to Jackson that he had a hard living lifestyle and was crap to his family hence the rejection now. Jackson confesses a similar story with his father and how he died of liver disease. Randy asks Jackson to stay with him so he doesn’t die alone. Meanwhile, Zach managed to secure a basement apartment for Randy and chipped in to pay part of his rent. There is a donor liver but not a match but Jackson has found a match: himself. Zach thinks it is a bad idea and doesn’t want Jackson to risk his life for someone he doesn’t know. Jackson insist he wants to do it and tells Zach about his dad. On Jackson’s surgical team is Jeremy and Billy, who we see his hands shaking as he scrubs up. However, that doesn’t come into play as Jackson gets an allergic reaction to the anesthetics and his air ways start to close. Jackson’s fate is left hanging at episode’s end. A sweet moment of breakfast in bed with Luke leads Charlie and Alex to start wedding planning ASAP. The two end up at a church were the Reed and Harrish wedding is about to take place. Alex and Charlie like the wedding and is about to go and book the venue when the priest arrives looking for the groom. The fear is that the bride has been left at the altar and not for the first time. We then hear the bride, Nadine, calling out for her groom, Foster when we see her take a nasty tumble that involves her tibia breaking through her skin. Charlie and Alex rush her to Hope Zion and on the way, Nadine describes how she met Foster and their wedding day is the day that they met. When Nadine arrives at Hope Zion, she doesn’t want anyone to cut her dress. Things start to turn bad for Nadine and she is wheeled into surgery to fix a clot and the ortho doctor will fix her leg. Foster the groom arrives and tells Alex that he didn’t leave her at the alter but left so he can perfect his vows but didn’t tell anyone and know feels like a schmuck. Alex promises that she will fix Nadine and that Foster will be the first person that she sees when she wakes up. Before heading into surgery, Alex wonders if they cursed Nadine and Foster. Charlie thinks that is a ridiculous notion. Alex then believes is she can fix Nadine then the curse is broken. We see Nadine’s spirit sit next to Foster but we don’t see Charlie interact with her. Charlie meets up with Dawn who congratulates him on his engagement to Alex. Dawn also tells Charlie that she be the first one he calls if he wants to return to work. The surgery goes well and Charlie and Alex become Nadine’s wedding planners to ensure that she and Foster get married the day they met. As the two watch the ceremony, Alex and Charlie decide to get married right after them. But I have a feeling this major trauma coming into Hope Zion is going to put that on hold. Also, the previews seem to heavily imply that Charlie is going to die and that what we see his is spirit giving Alex a tearful speech. I hope that isn’t true but seem inevitable for these two. It would be interesting if the show ends with Alex getting the gift to see spirits. Programming Note: I won’t be able to recap the series finale next week but I will still have a recap but just a day late. Thank You for another great recap. I hope Charlie and Alex get their happy ending. They have been through so much and they love each other so. Life is full of so many disappointments and so many don’t get happy endings. I hope this couple is one that does. Appreciate your kind words. I too hope for a happy ending for both Alex and Charlie. This is one of the cleanest, classiest shows on TV thank youfor an amazing 5 years! My husband and I are so disappointed this show is going off the air! We really looked forward to watching Saving Hope every week. We love the cast everyone was awesome. We have teenagers and children in their 20’s it’s so awkward to watch TV with them in the room but not Saving Hope! We will miss this show terribly! i really wish they didn’t have charlie die. if this is the end of the show why not have them be happily married after all they have been through. i went through the same things with my husband. the last time in the hospital he did pass away. this episode was so heart wrenching for me. i will never watch this show again. too emotional for ,me. I will really upset that Charlie and Alex finally find happiness and finally get married, but then they kill Charlie almost immediately after. I hoped that being the last season, the writers would have made their fans happy, but left them all very sad. I am sad to see Saving Hope going off the air. My family loved watching this show every week. I really, really wished they ended it with a miracle of Charlie coming out of his coma and getting their happily ever after that all the fans wanted to see for a finale. I was really upset that Charlie and Alex finally find happiness and finally get married, but then they kill Charlie almost immediately after. I hoped that being the last season, the writers would have made their fans happy, but left them all very sad. I really wished they ended it with a miracle of Charlie coming out of his coma and living happily ever after for the finale. I did not see this show from the beginning and I missed so much .